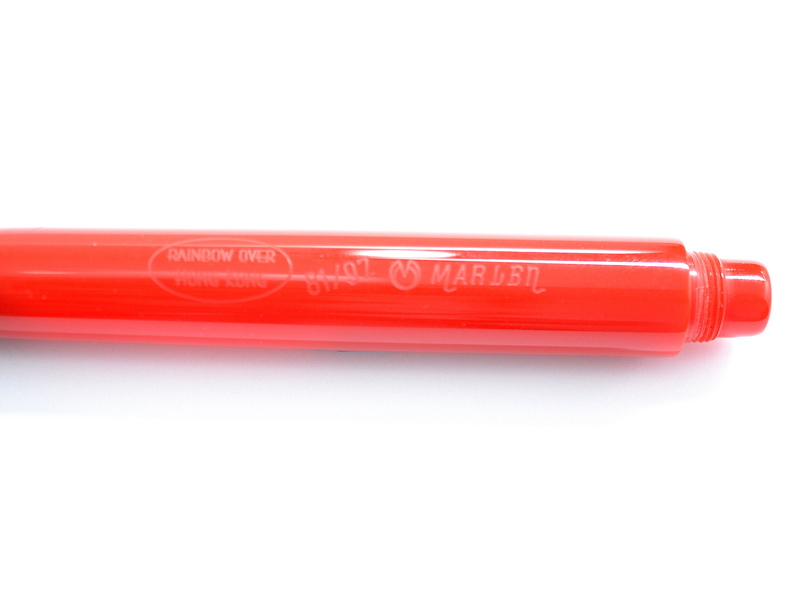 Marlen is an Italian pen manufacturer that doesn’t get much attention. They make weird pens…not sure how else to put it. Their designs are unconventional and polarizing. 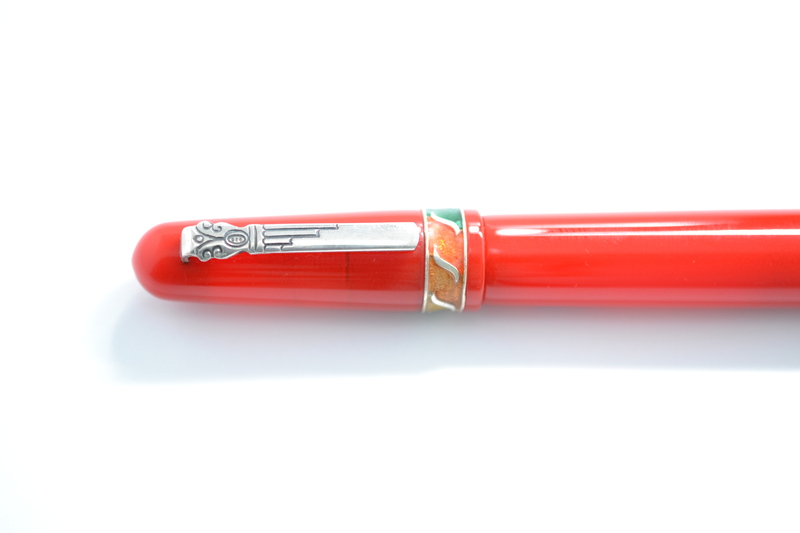 I never had much interest in them but early one morning while fighting off some jet lag I started perusing fountain pens on eBay and I came across the pen I am reviewing today, a Marlen Rainbow Over Hong Kong. 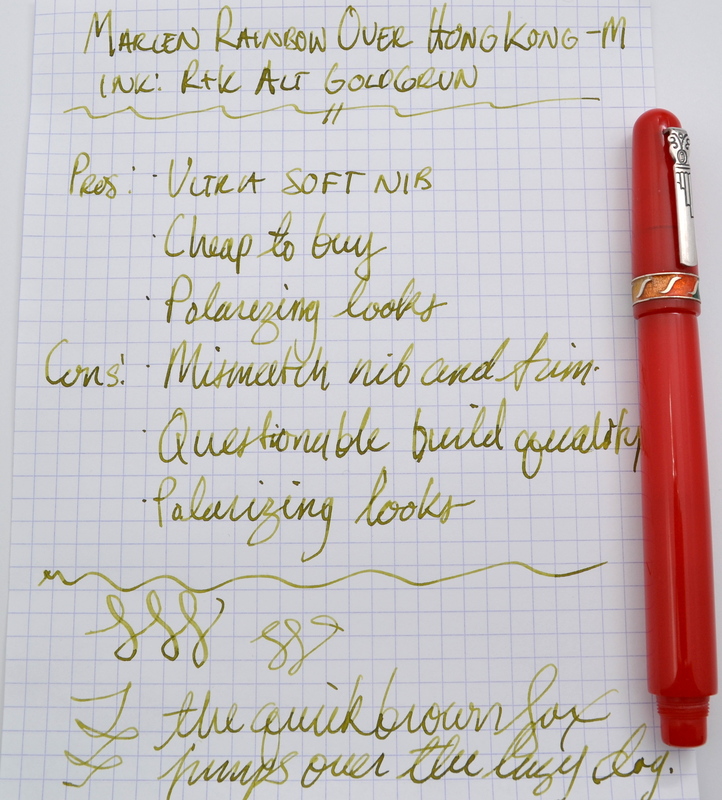 It was new old stock and had an 18kt gold nib for a bit over $50…I figured why not? Some background on this odd pen. First of all, this pen was sold in a set of seven pens (yes seven pens!) in the colors of the rainbow. 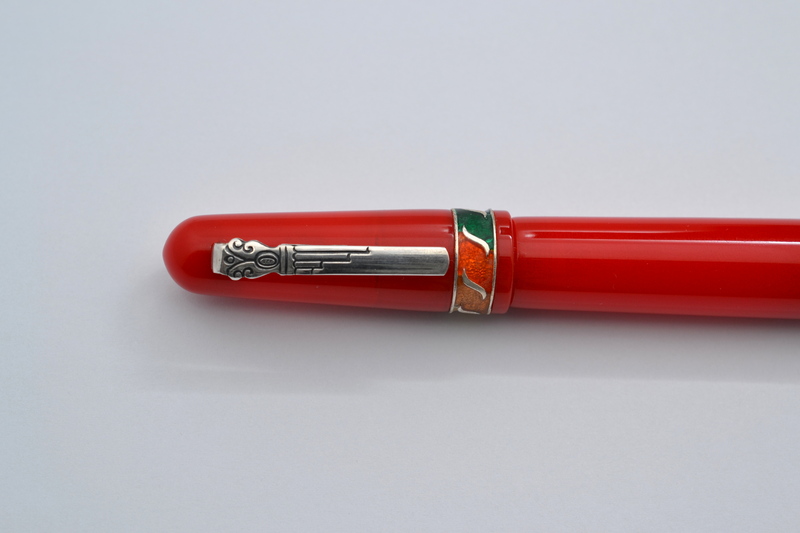 These pens were produced to celebrate the return of Hong Kong to China in 1997 and as such they made 97 sets in 1997. Not surprisingly, few people bought the sets (who wants seven of the same pen?) and now today you can purchase new individual pens from the set for very cheap. 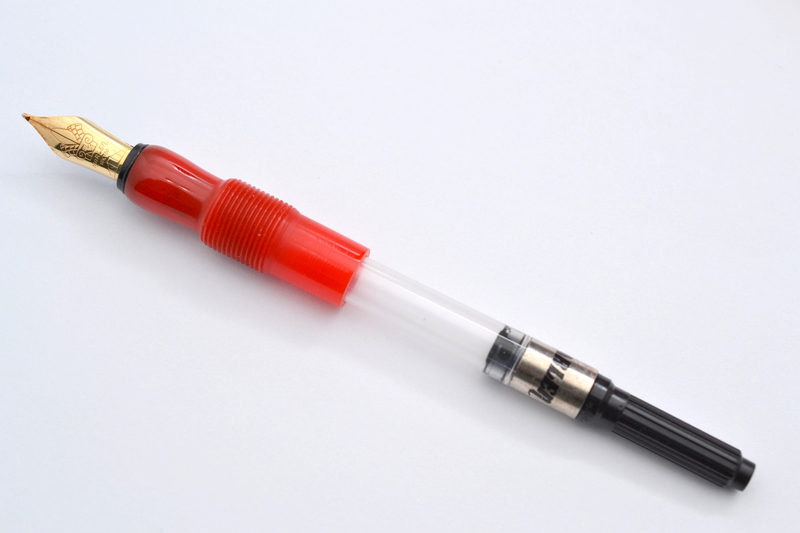 My pen is made from a beautiful red plastic and has a tapered shape that continues from the end of the barrel through to the cap. The end of the barrel is threaded so that the cap can screw onto the back. It’s not a brilliant look if I am honest but it’s functional. The cap features a solid sterling silver clip with a Greek column design. The cap band is done in rainbow colors with sterling trim and looks a bit sloppy, the colors are not very uniform and in some spots overlaps the sterling silver. Unscrew the cap and you will see a small bulbous grip section and a small gold nib. This is the only pen I have owned where the threading on the grip section is used to secure both the barrel AND the cap. I could be wrong but this seems like a cheap shortcut. The downside is you end up with a small grip section and nib. 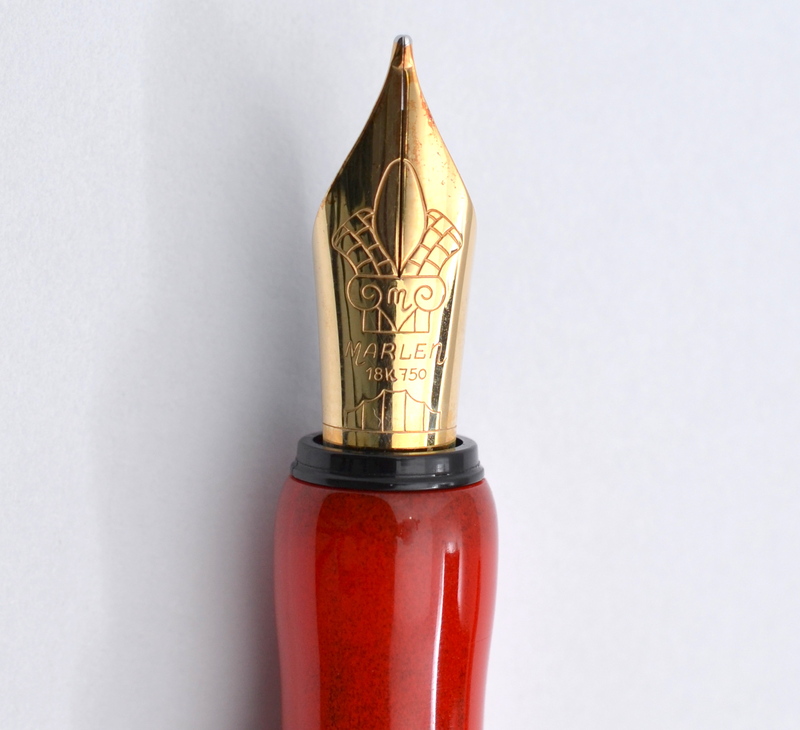 The nib is 18kt yellow gold which does not match the other metal furniture. The nib has a column design with what to me looks like an ear of corn on top (if someone knows what it actually is please let me know). 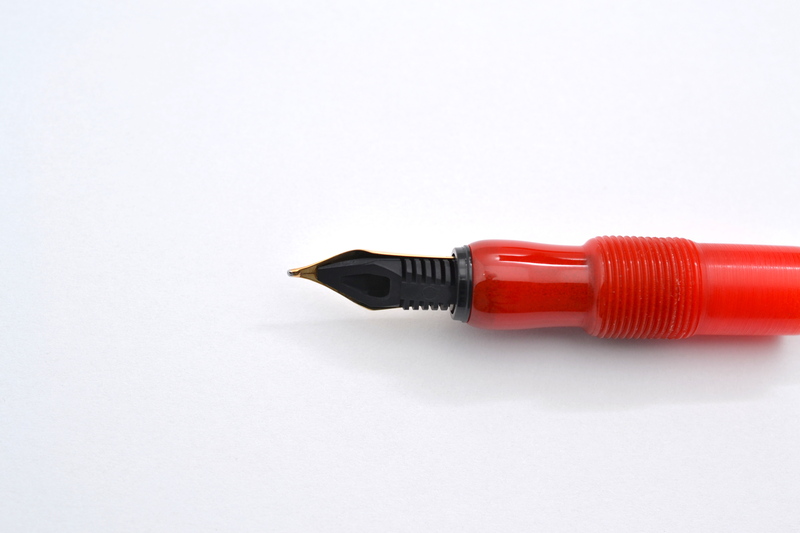 The nib is unbelievably soft and springy. The only other semi-modern pen I can think of with a nib like this is the first year of the Pelikan M600 with the mono-tone 18kt gold nib. It’s an amazing nib. Empty this pen weighs a comfortable 23 grams and measures 14cm long capped. I found the small grip section to be comfortable enough though I found myself gripping the pen on the barrel which this pen doesn’t like. Because of the cheap single threading when pressure is applied to the nib from the barrel the section moves slightly and clicks occasionally…this is annoying for sure. The pen is numbered and I have number 81 of 97. The red plastic has a bit of translucency to it and you can see on the cap there is a line where some of the color has worn away. See that dark line going around the cap? So what do I think of this pen? It’s not made very well but it has a fantastic 18kt gold nib and can be had for around $50-$80 new old stock…if you can get past the design and it’s quirks it’s not bad. What a fun and quirky find. Thanks for sharing this.